Did you know there is Women's History Month? An eye opening question our moderator Michelle Bergquist, CEO & Co-Founder of Connected Women of Influence, asked the audience. Along with being a nationally recognized author, award-winning entrepreneur and professional speaker, Michelle is also Co-Founder to the annual Business Women's Mega Mixer events that celebrate Women's History Month. 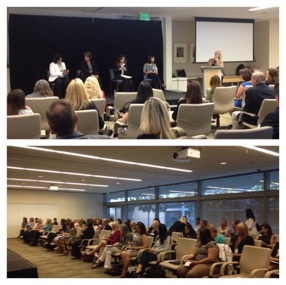 On June 18th we celebrated (4) CIO females that spent time with us to share their journey. - Jeanette Sanchez, CIO for AMN Healthcare Services, Inc. and the 2015 Top Tech Exec Award and the 2013 California National Diversity Council Most Powerful and Influential Women of California. With her experience and sense of humor, Michelle set the stage to lead our CIO panel discussion and prepped us for an informative night. The audience was eager to hear more eye opening questions from Michelle and the answers from the CIO panel. There was a lot of ground to cover and Michelle immediately dove right in. How do you leverage social media? Some tweet, some chatter, and almost all CIOs LinkedIn. Sue-Jean stressed on the importance of utilizing this tool to brand yourself and exemplifies how you network. At minimum you should have 500 followers. Show your value within your company and outside your organization. Jeannette advised us to be active participants by joining in conversations, sharing industry knowledge, and learning about new technology. When Michelle asked the audience about LinkedIn and their interaction, the results varied. Everyone in the room had an account, half of the room kept their profile current, and about 15% of the room used LinkedIn on a regular basis like our CIOs recommended. What skills helped you advance from professional to management to CIO? Do not stay stagnant! Be open to transitions and changes around you. All of our CIOs have different backgrounds and held multiple roles in other parts of the business that helped accelerate their career progression. Pandora suggested researching outside interests in other positions within your company and learn how your role relates to other industries. If you work in IT, have lunch with a co-worker in Business Development or vice versa. Not only does this help you become knowledgeable, it also shows your value to your business or company. Lynn continued on Pandora's previous point. Enrich your experience and collaborate with others. Collaborating with outside teams is an important leadership skill that can take you to the next level. Look at yourself and ask "how do I add value to me and my company?" Ideas do not need to be net new to offer a business solution. "Mentorships are key in your career advancement", said Pandora. She was always curious about learning and educating herself in other industries. Even with a solid career she still went back to school achieve an MBA degree that later in life catapulted her to CIO. Lynn left us with "Get out of your comfort zone! Now is the time to take risks and be courageous!" Men advance their careers slightly differently than women. 75% of men apply for positions even if they are not 100% qualified. 75% of women will not apply for a position unless they are 100% qualified with the skillset listed on the job application. How do CIOs work with the Board to get funding? CIOs present their business case seeking approvals to receive budget for projects. They have to talk sheik not geek and ensure it aligns with the business strategy. Communication is a skill that allowed Sue-Jean to switch from CIO to CTO to CIO again because she could articulate her thoughts and strategies that resonated with the board. Your business case should include more than just the ROI. It should also include the hidden numbers behind ROI and the success probability. To prepare, create foundation, understand risk factors, and break up projects into small deliverables. Get the boards' ears immediately and communicate confidently. Exemplify how IT will innovate and change the trajectory of the business. If there is a miss, own the mistake and move on to another idea. Do not strive for perfection, nothing is every going to line up perfectly. Be ready to change the dynamics and add value from that experience. Remember, most decisions are made outside the boardroom. Those in the audience may not be presenting to a committee yet, however being politically savvy will go a long way with your team and upper management. What keeps these CIOs up at night? Nothing keeps Lynn up at night. She makes a conscious effort to get out of her brain and think of other things she is passionate about. Every night she takes 20 minutes to recap the day and asks herself "how did she add value today?" For Sue-Jean, she is always asking herself "What is coming next? Nothing can be calm for too long, the tide is coming...What is changing? How can she prepare her team? Sue-Jean's team has heard encouraging words over the years of change: "Ride the wave, play the game, be positive and you will win again and again." Jeannette also feels the responsibility to understand her team and be a positive influencer on them especially during change. Cyber security is an upcoming fear Pandora and all CIOs will be experiencing. Was being CIO always in your career path? Half of our panel did plan on pursuing the CIO role and set goals for themselves years prior. The remaining half had great networks and they worked their way to have the right opportunity present itself to them. CIOs do not need to be technical. CIOs need to understand technology and how it drives the business forward. Half of the panel started in IT or had a technical background. Technology is everywhere, everyone uses technology, and anything is possible. RGP concluded the night by giving away several raffle prizes and provided information on their consulting company and culture. RGP was recognized by Forbes as 2015 Most Trustworthy Companies in America. Each CIO graciously volunteered 1 hour mentorship as part of our WITI raffle. How lucky are these winners? Word of the night was VALUE. How do I add value to myself, value to the business, value to the IT communities, and do it daily? Never be afraid for change, step up and roll up your sleeve!